I've often wondered why my garage door is so easy to lift. It turns out that the electrical motor has not been the one doing all the work. The real heavyweights are my garage door torsion springs. 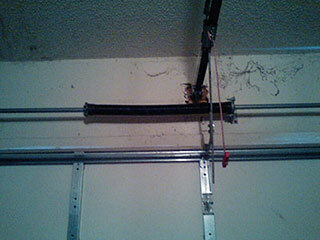 Garage door springs are part of a counter balance system designed to help lift a garage door and keep it feathery lite. The weight of the door is supported by garage door tracks when it's up in the horizontal position. The weight then shifts from the rails to the torsion spring as it closes taking a vertical position. The counterbalance system's torsion spring coils itself tight providing just the right amount of resistance to keep the garage door from crashing down. This happens because the spring naturally wants be unwound, and it has to lift the entire garage door to achieve its coil-like Zen. Torsion springs are often given a five to seven-year life sentence before they're expected to hit the hay. This is really a guesstimate because torsion springs are given life cycles. A cycle occurs when a garage door fully opens and then fully closes once. The most common life cycle rating for a garage door torsion spring is 10,000 cycles. It can be more or less depending on the manufacturer’s process and materials used. There are other things that can affect how long it takes for your spring to break, but it's pretty safe to say that the average enthusiast may need a few years until the next garage door torsion spring replacement. Owen L. Dautrick filed his patent (US1724995) for the counterbalance system on November 20, 1922. Dautrick’s original design incorporated sectional doors, garage door tracks, a counterbalance system, and an option for the use of an electric garage door opener. It was Dautrick’s design which made cumbersome garage doors lighter than air. However, the very first patent in a series of improvement to the garage door actually belongs to J. H. Lawrence. Lawrence patented (US313085) a roller plate to help open and close barn doors on March 3, 1885. Lawrence probably wasn’t thinking about how to better protect an NC supercharged miata from the elements at night. But, I like to think he had the right idea in a long line of great ideas.